Part of the fun of vacation is shopping for souvenirs, at least it is for me (I think my husband might disagree). In the past, I’ve brought home my share of clothing and jewelry that I never end up wearing, so I’ve learned the hard way what to buy and what to pass by. I always like to think ahead a bit about what I might want to get, while still leaving room for a have-to-have surprise! 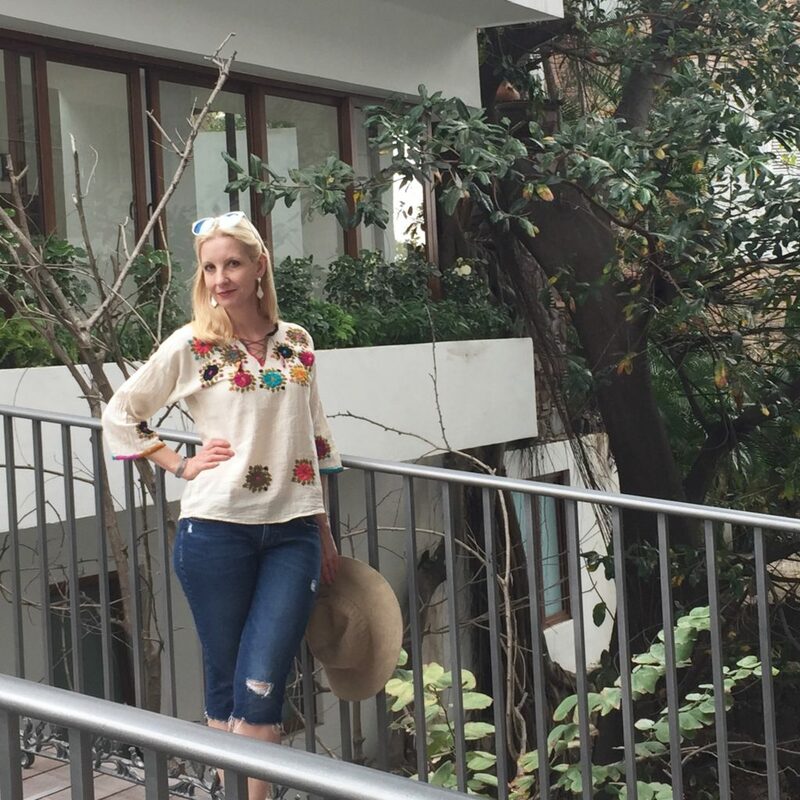 It was just my luck that the embroidery trend happened to coincide with my Puerto Vallarta trip! The markets and boutique were full of pretty cotton blouses with floral embroidery. I knew for sure I want to get myself a good quality one that fit just right, so that I’d actually wear it once I got home. But then if you’re anything like me, you can’t wait to wear what you bought! I try to add one souvenir piece to an outfit rather than looking like a walking billboard for the local shops. I’ve pretty much stopped buying t-shirts on trips, yet when I saw this one, I couldn’t pass it up. Not only did it have a photo of the amazing Frida Kahlo, it also was a Vogue cover! Now, the husband has his own ideas about souvenirs and wanted to bring home an iguana. I love animals, but … umm, no. I also bought a pair of pretty silver butterfly earrings, along with several funky handmade earrings at the local flea market. We were tempted to bring home pretty Talavera pottery, but wasn’t sure if it would make the trip back without breaking. We also saw lots of fabulous paintings by local artists, but nothing that we thought would actually fit our decor at home. It’s hard not to come home with everything! So Dolls, what do you like to buy as a souvenir on trips? If you buy clothing or jewelry do you wear it right away or wait until you get home? 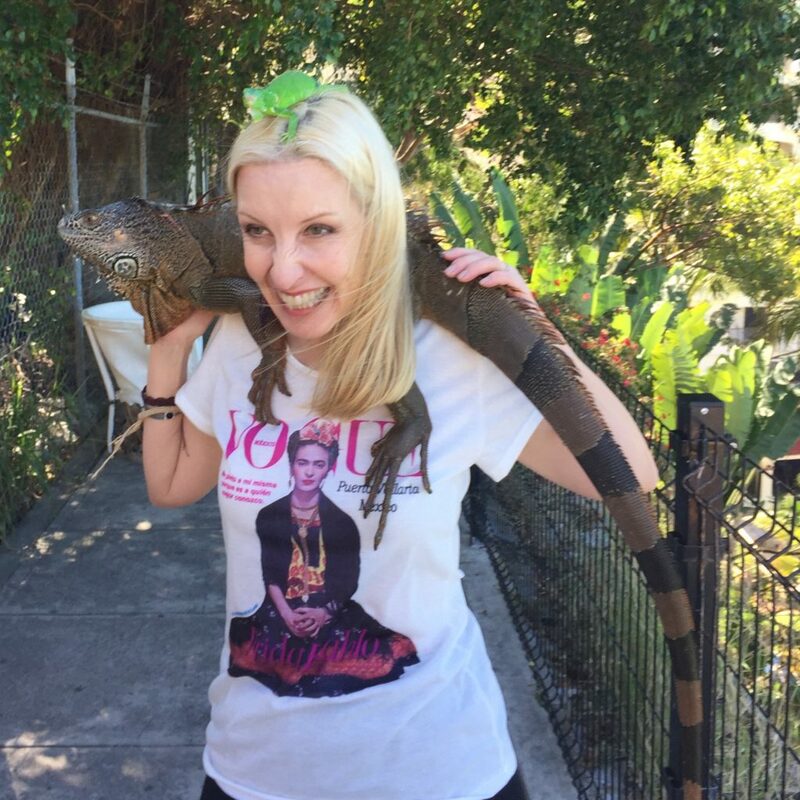 Has your husband ever wanted to bring home an iguana?! For those of you following my lap top drama, I’m happily typing on my new one right now. I decided my accident of spilling coffee on my old one brought two gifts with it: Number 1, a reminder to slow down and not try to do ten things at once (which I was doing when I spilled), and Number 2, an excuse to buy a shiny new one. I always try to find the positive in any situation anyway! Don’t forget to sign up for the Fashion Should Be Fun newsletter to get special sales alerts, coupon codes, and more! And have an amazing start to your week! Love this post — and I am reminded of a trip we took, three years ago, to San Juan. I loved the “old town,” which is lined with all sorts of great boutiques. There was a wonderful shop called Pure Soul, which was reputedly launched by someone affiliated with Chico’s. They had all kinds of lovely things, including artisan jewelry and embroidered tunics that reminded me of Frida Kahlo. I wear them in the summer and remember my trip each time I put them on. Dawn, I don’t have a fashion blog like yours (I am a writer and just use my site for my published work), but I will try to remember to take a photo and send to you. Again, I am really enjoying your blog! So much fun and I love your embroidered top! 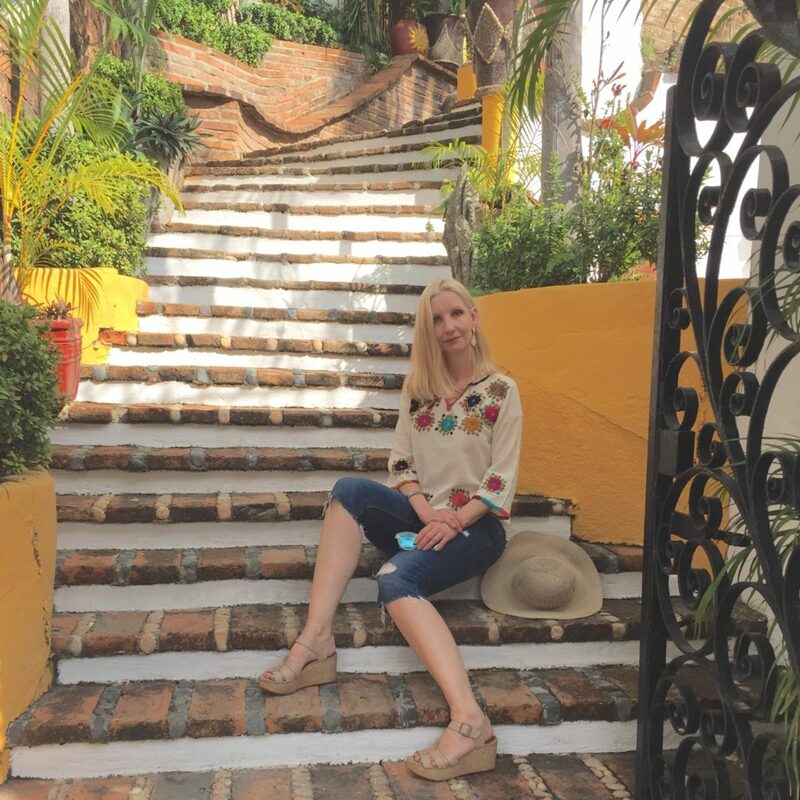 Next time you are in PV, you should check out Mundo de Cristal in old town. Plenty of talavera pottery and lovely glassware. I bought 8 wine, 8 drinking and 2 pitchers in the local ‘confetti’ pattern. Shipping was reasonable and they guarantee their incredible packing for airline carry on. If you choose not to ship. Definitely worth the stop! 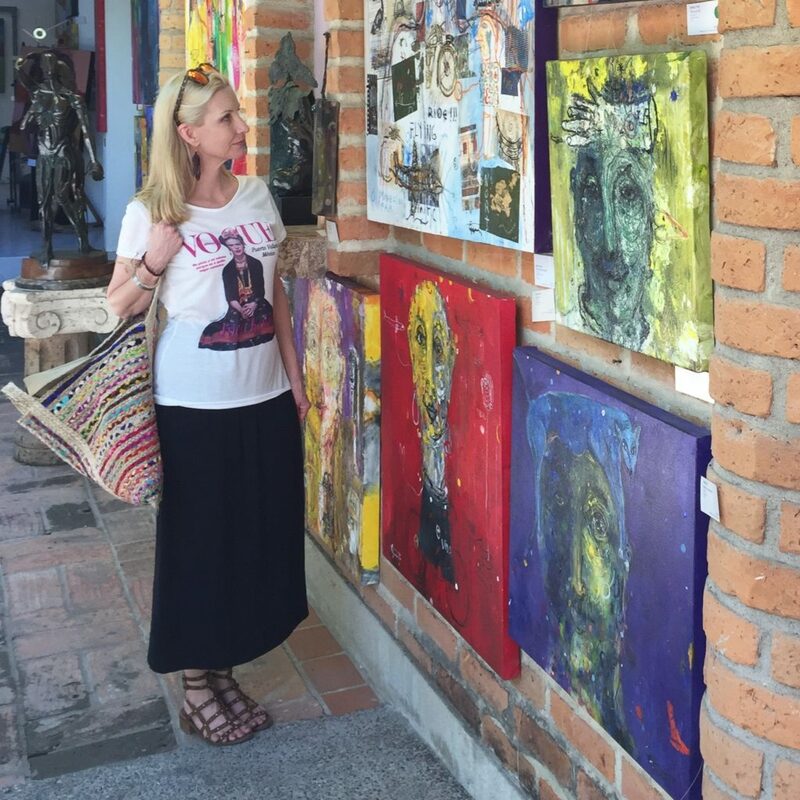 Love your Frida T-shirt! I agree that finding fun souvenirs is part of the fun of going on vacation. Looks like you had a fabulous time! I love that tee! And your blouse is a simular one I have worn as a little girl, with sort of glass in it! Lovely to see again! You are just so darn adorable! I’m not sure there is any fun look you can’t pull off. i love that tote bag, couldn’t find it on their site tho. i love buying souvenirs that i will actually wear, sometimes it’s daily (like my 3 bracelets that stack and go so well with each other despite being from sedona, israel, and austria. sometimes i get a unique statement cuff, and if possible i buy something that is locally made (or at least in the country, like my necklace from slovenia!) don’t you just love reliving your travels with those types of piece?!? i do, i feel proud! also now i want to go on a beachy vacation like you did, lol. 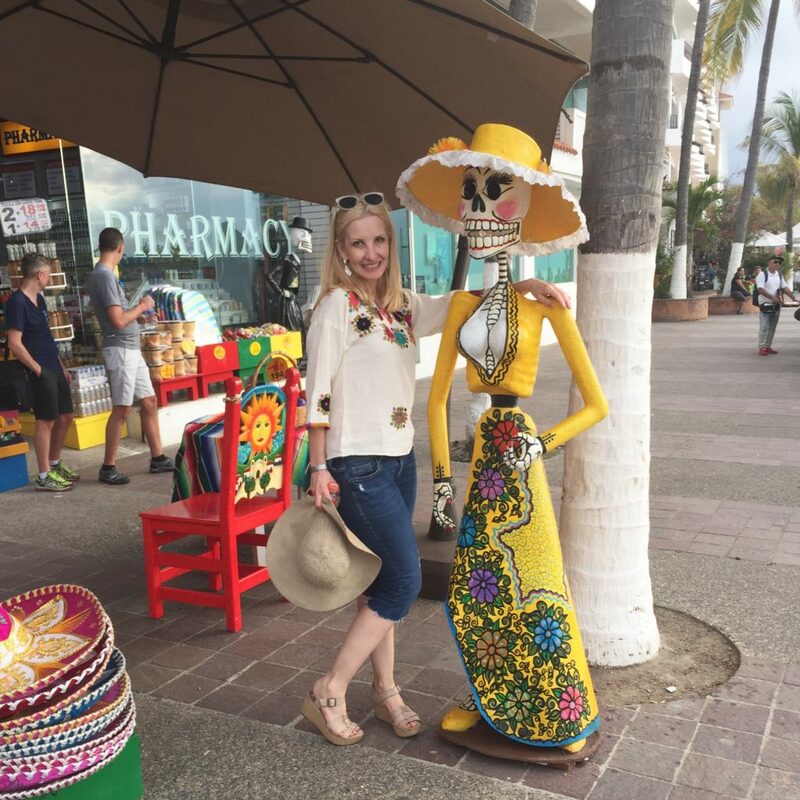 Fabulous post and timely as I am reading your blog while in PV on family vacay….loving it and looking forward to hitting the markets….